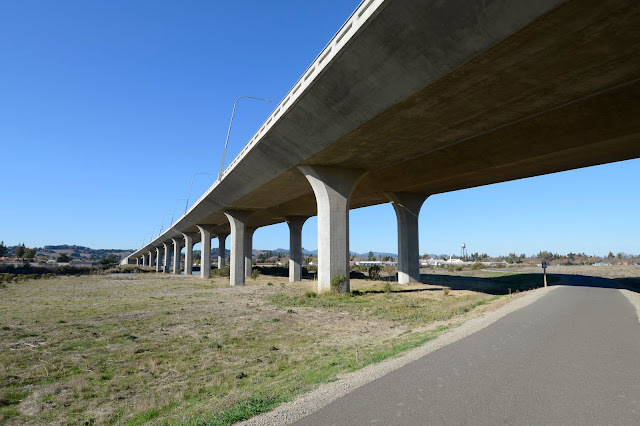 The West Imola Avenue (State Route 121) Bridges cross over a wide flood plain along the Napa River. The area east of the river is a 'Habitat Recovery Project' where they are trying to coax original species back to the wetlands. The bridges also cross the Napa Valley Railroad and the Napa River trail (with their own bridges across Tulucay Creek). The West Imola Avenue Bridges are supported by single column bents with wide flares. The bridges are 2142 ft long with 150 ft long river spans. The bridges include walkways and are 45 ft from edge of deck to edge of deck. Minimum vertical clearance is 60 ft above the river. The bridges have a sufficiency rating of 81.5, which seems low for seven year old bridges. The decks scored 6 out 9, but they looked okay when we drove across. 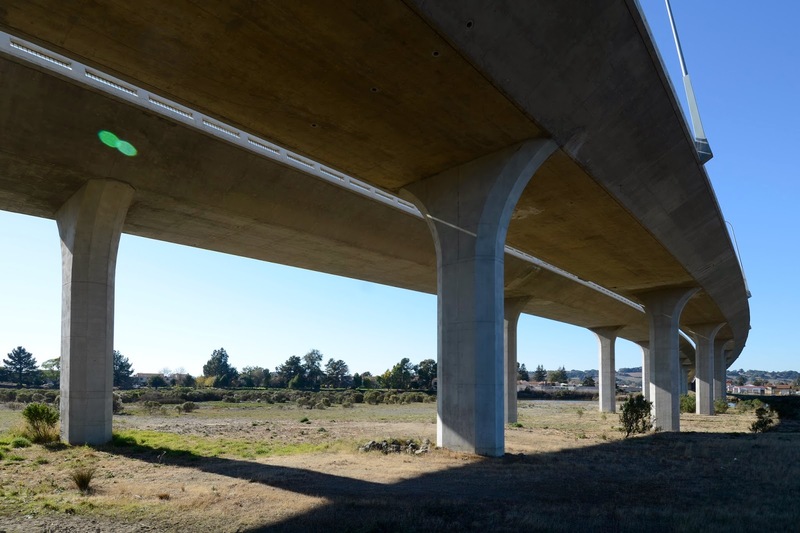 Napa Valley has no expressways taking travelers east and west and rush hour traffic is particularly bad, especially on the previously studied Napa River Bridge. Traffic on the West Imola Avenue Bridges was 16,000 vehicles a day but that was counted when the bridges were first opened to traffic. Napa County, California Bridges: West Imola Avenue Bridges across the Napa River (2) by Mark Yashinsky is licensed under a Creative Commons Attribution-NonCommercial-NoDerivatives 4.0 International License.